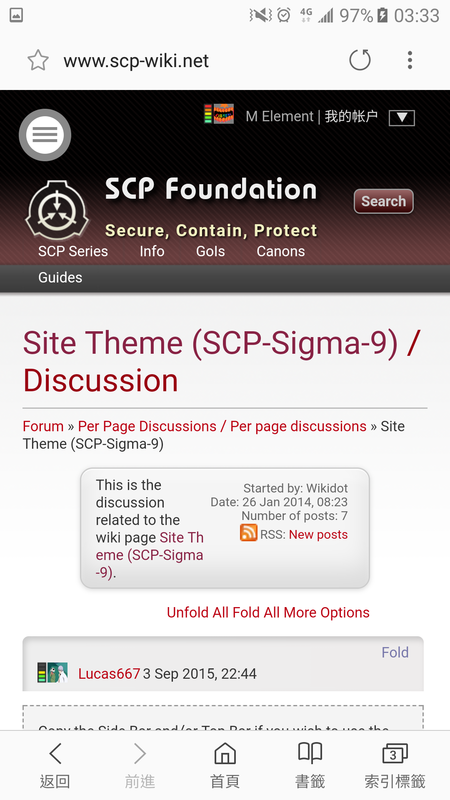 This is the discussion related to the wiki page	Site Theme (SCP-Sigma-9). Copy the Side Bar and/or Top Bar if you wish to use the new format for those. Note that the bullet icons are attached to the side bar page as well. Copy the Front Page template, including attached files. That's tricky. Some elaboration is necessary. First of all, these pages are not side:bar and top:bar, their names are nav:side and nav:top, respectively. Second, even when opening these pages directly you cannot see their source. Luckily this can be circumvented using a "magic hash" in a Wikidot URL that lets you go straight to a page's history. Top, Side. See the most recent review and press the [S] button for page source. Hahaha, I always get confused with it. I didn't realized that I wrote it wrong. Anyways, thank you very much, now I can see all templates. - I made a new page titled "component:theme"
So it telling me to copy the sidebar, topbar and main but, where do I paste it?